Immediately after the fire erupted many media outlets began to raise serious questions about the level of safety and preparedness inside the building. Residents through their organizations had complained for several years about concerns related to the lack of sprinklers, fire alarms and effective maintenance of the structure. Apparently these complaints were not addressed by the Royal Borough of Kensington and Chelsea (RBKC) Council which is said to be the owners of the flats. Hundreds of residents and their supporters attempted to storm the RBKC Council proceedings on June 16 demanding answers to their questions. The doors of the building where the Council was meeting were locked as demonstrators rallied outside. Residents and their family members who were interviewed by the press spoke to the abject failure of the owners and the Kensington and Chelsea Tenant Management Organization which was supposed to oversee the conditions in the building. 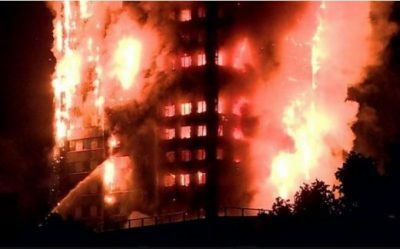 These entities did not provide proper fire prevention and rescue operation protocols at Grenfell Towers. After the fire started some residents reported that they were instructed by municipal employees to remain within the building. Nonetheless, hundreds of the residents were able to escape without being severely injured. Others remain in hospital with some under critical care. Later people rendered homeless went to makeshift relief centers seeking food, clothing, water, blankets and counseling. Volunteers from throughout the community donated supplies and food to the affected residents. London Mayor Sadiq Khan visited the area of the fire the following day and was met with loud protests by residents and community members. The criticism centered on the absence of information related to transitional housing, clothing and food. Other concerns voiced by residents were the desire of many who were burned out that they could remain in the same neighborhood. Impacted tenants felt that these issues were not satisfactorily addressed by municipal and national governmental officials. British Prime Minister Theresa May was admonished as well for failing to meet with residents and their families. She did visit the fire scene however the prime minister only spoke with firefighters and the police. Later she visited some of the injured victims in hospital. Even the state-sponsored British Broadcasting Corporation (BBC) could not conceal or minimize the culpability of the municipal officials in creating the conditions for the fire and subsequent deaths. Although North Kensington is considered a high-income area of London undergoing rapid gentrification, there are still large numbers of marginalized residents many of whom are from people of color communities with heritages in Africa, the Caribbean, South Asia, and the Middle East. 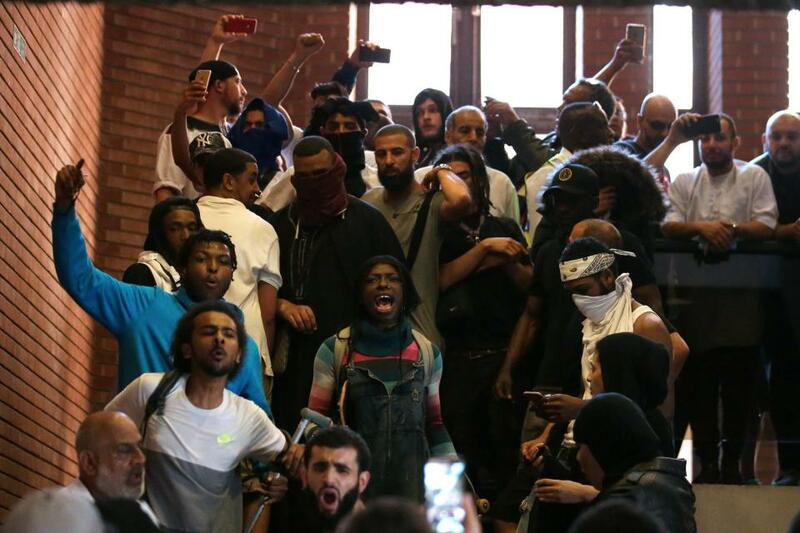 This racialized aspect of the disaster at Grenfell Tower became evident to readers and viewers of the media since a disproportionate number of people being interviewed were from nationally oppressed groups and the lower rungs of the working class. Anger is burgeoning among these groups who are saying the fire, its swift expansion, and the resulting injuries and deaths, were unnecessary. The general consensus is that if adequate safety precautions had been taken the fire may have never started or been confined to a small area of the housing block. The channeling of marginalized and oppressed groups into what is called “social housing” in Britain is clearly a manifestation of the class and racial oriented approach to urban planning that permeates London and other major cities. Many of these social housing complexes are located in ageing buildings which have been refurbished in recent years utilizing substandard materials creating a tinderbox. Experts have cited the use of cladding at Grenfell Tower as a possible cause of the rapid spread of the fire. With this being a 24-story building firefighters did not have the equipment to reach the higher levels of the structure leaving people helpless in the face of imminent death. Although higher-income housing developments are within the same general area as Grenfell Tower, the safety of the poor and working class residents are not treated with the same sense of urgency and necessity. Despite the fact that residents had repeatedly expressed their fears related to structural problems within the block no serious efforts by the municipal authorities were enacted. Placing low-income residents from oppressed groups in high-rise tower blocks serves two obvious purposes. The buildings serve as a mechanism to contain the demographic shift of British and other European municipalities restricting the geographic spread of people of color communities. From a financial perspective, by concentrating African, Asian, Middle Eastern and other working class residents in confined spaces where maintenance and safety costs are de-emphasized, it provides the capacity for urban governments to channel tax revenue as incentives for private housing and commercial developments which is far more lucrative for corporations which specialize in these projects. What remains to be seen is whether the British government will learn from this calamitous event providing policy imperatives to construct housing units which are safer and more humane for the working poor and immigrants. Prime Minister Theresa May had good reason not to want to meet residents of Grenfell Towers and their neighbors. A recent election in the country, which many political pundits say was unnecessary, resulted in the Conservative Party losing its absolute majority in parliament forcing the ruling group to seek an alliance with the small Northern Ireland Democratic Unionist Party (DUP) in order to form a government. The prime minister could not afford to be seen on British and world television being heckled and denounced. It is questionable whether May will be able to survive in her position in the coming weeks and months. Britain has been the site in recent months of several high-profile terrorist attacks in London and Manchester where many people have died. On June 18, a crowd of Muslims coming from the Finsbury Park Mosque in North London were targeted by a white racist who drove his van into pedestrians. One person died in the attack and several others were seriously injured. People in the area said the assailant remarked that he was intent on killing Muslims. The following day on June 19, Britain began negotiations with the European Union (EU) over its delinking from the continental organization. Brexit stemmed from another miscalculated election in June 2016 where the voters decided to withdraw from the EU, costing former Prime Minister David Cameron his position and triggering a recession inside the country due to the economic uncertainty going into the future. Britain along with other western capitalist states will continue to experience political instability in light of the growing class and sectional differences among the populations. As long as the wealthy elites enhance their status with disregard for the majority of the people within society, the mounting social contradictions will undoubtedly prompt further economic turbulence and protracted ideological conflict.